Become one of the elite, one of the chosen, one of the cursed. This is the game of normal people imbued with super powers and all the wealth, fame, and heartache that comes with it. Supers are eveyrthing from movie and rock stars to vigilantes to mercenaries. However, with great power comes Taint which leads to physical deformity and madness. WELCOME TO THE DARK FUTURE The Corporations control the world from their skyscraper fortresses, enforcing their rule with armies of cyborg assassins. On the Street, Boostergangs roam a shattered urban wilderness, killing and looting. The rest of the world is a perpetual party, as fashion-model beautiful techies rub biosculpt jobs with battle armored roadwarriors in the hottest clubs, sleaziest bars and meanest streets this side of the Postholocaust. The Future never looked so bad. But you can change it. You've got interface plugs in your wrists, weapons in your arms, lasers in your eyes, bio-chip programs screaming in your brain. You're wired in, cyberenhanced and solid state as you can take it to the fatal Edge where only the toughest and coolest can go. 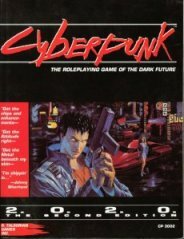 Because you're CYBERPUNK. The year is 1876, but the history is not our own. The American Civil War rages on, neither side able to establish a clear advantage. Most of California has fallen into the sea. The Sioux Nations have reclaimed the Dakotas. And the dead walk among us. 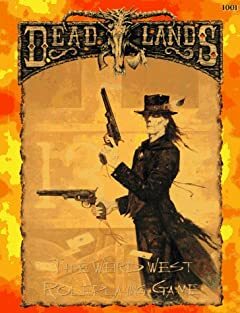 In Deadlands: The Weird West Roleplaying Game, players take on the roles of hexslinging hucksters, mad scientists armed with weird, steampunk gizmos, deadly gunfighters, fearless Indian braves, and wizened shamans. In 1863, a vengeful warband called the Last Sons unleashed the manitous upon humanity, and nothing has been the same since. Endless adventure and untold excitement await! Prepare to venture forth with your bold companions into a world of heroic fantasy. Before science, before history, an era of magic existed in our world's dim past. Magic flowed freely, touching every aspect of the lives of men and women of the Namegiver races. It was an age of heroes; an age of fantastical deeds and mythical stories. It was the Age of Legend. As the levels of magic rose, so did the dangers in the world. The rise of magic lured the Horrors from the depths of astral space—nightmarish creatures that devoured all life in their path. For four centuries, entire nations hid underground as the Horrors devastated their lands during the dark time that came to be called the Scourge. A century ago, the people of Barsaive emerged from their sealed kaers and citadels. 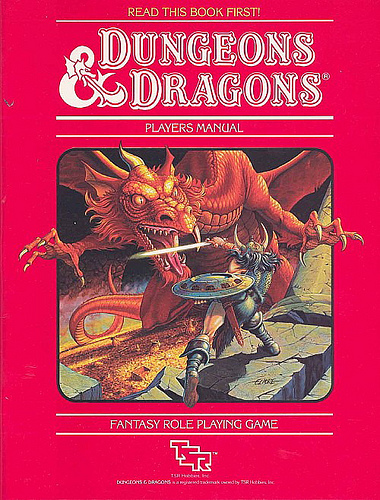 Trolls, dwarfs, elves, orks, and humans live side by side with exotic races: the lizard-like t'skrang, the small winged windlings, and the earthen obsidimen. Fantastical creatures dwell once more in the forests and jungles. Arcane energies offer power to those willing to learn the ways of magic. In the Age of Legend, bold heroes from all across Barsaive band together ready to fight for life and freedom against the remaining Horrors and the oppressive Theran Empire, which seeks to bend the rebellious province again to their yoke. Through noble deeds and sacrifice, the heroes of the world forge Barsaive's future, arming themselves for their daunting task with powerful magical spells and treasures. Study. Party. Save the World. East Texas University promises prestigious leadership, connected alumnae, the fantastic Southern climate of Pinebox, Texas…and annoying roommates, professors that try to kill you (literally), and things that go bump in the night. Enroll at your own risk. A long time ago, in a galaxy far, far away... Experience the drama and epic scope of the greatest space fantasy of all time! Adventure in a universe of epic heroes, fearsome villains, amazing technology and strange aliens. Pilot an X-wing against the Empire's devastating TIE fighters! Trade blaster fire with vicious bounty hunters! Smuggle contraband cargos through Imperial blockades! 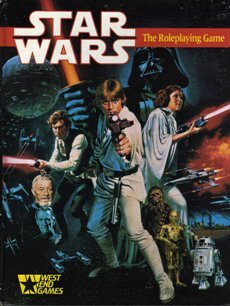 Learn the ways of the lightsaber-wielding Jedi Knights, and master the powers of the Force!